There were 185 lots of medals and militaria in this sale. Lot 19, a Military General Service Medal with 2 clasps and a re-named Waterloo Medal to William Brake, 28th Regiment, sold for £2,006. The Boer War was well represented with 15 pairs or singles of QSAa and KSAs. 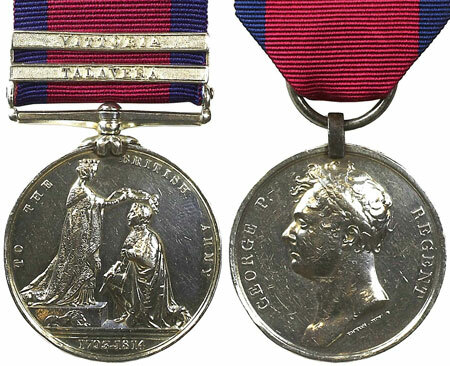 The best result was a 7 clasp medal to Corporal Jenner, 2nd Dragoons, which sold for £342. WW1 gallantry was again well represented in the sale with lot 42, a scarce Military Cross, Military Medal group to Sergeant/2nd Lieutenant Frank Vessey, who died in October 1918, selling for almost double estimate at £3,894. 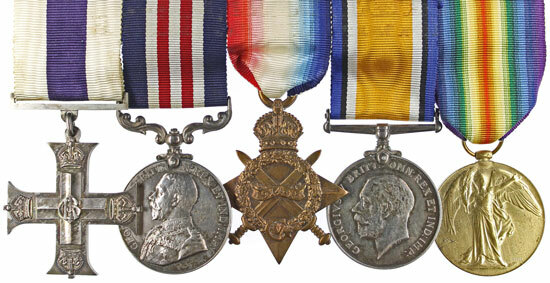 Lot 45 was another double gallantry group with a Distinguished Conduct Medal and Military Medal awarded to Sergeant Joseph Moran, Lancashire Fusiliers and Machine Gun Corps. These sailed past the estimate costing a room bidder the sum of £2,596. The highlight of the WW2 section was a 1943 Military Medal group to Gunner J M Hume, Royal Artillery, awarded for his bravery as a wireless operator in support of 2nd London Irish Rifles in Italy, which sold for £974. There were 26 lots of foreign medals and 22 lots of militaria. Lot 164 was a Third Reich SA dagger which sold for £413. Our next medal auction will be held on Wednesday 17th August 2016. Look out for the full catalogue for this sale, which will appear on our website approximately three weeks before the sale. Also keep an eye on our Twitter and Facebook pages which will include updates of our latest auction news.